10 Best Electric Skateboard (Longboard) of 2019 – Reviewed! If you want to look cool, getting a skateboard and riding it around is one sure-fire way to do so, providing you know how to do it, of course. There is nothing else in the area of recreational transportation which has captured the attention of youth or anyone looking for that bit of edge to spice up their image. The popularity of stunt competitions serves as more proof of how eager people are to show off. But if showing off is not your main objective, and if you would instead like something which is both fun and can get you somewhere, then perhaps you would benefit more from an electric skateboard. 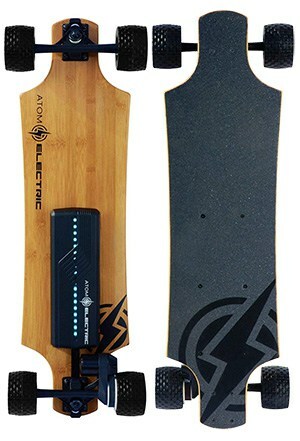 Electric skateboards are exactly what they sound like—skateboards which are powered electronically. Electric skateboards are usually operated by a remote you hold in your hand by which you can control the speed and direction of the board. This saves you both stamina and time needed to learn the skills necessary to drive a proper skateboard. Of course, in some areas learning to drive an electric skateboard can be more challenging than learning to drive a standard one, but nevertheless the device is geared towards practicality more than its non-powered counterpart. Despite what we said about electric skateboards not being as cool as regular ones, with the right board and proper attitude while riding it, you can still outshine any mediocre skater with your shiny new gadget. Besides, most electric skateboards can be ridden regularly as well. That is why we have prepared this list. On it you will find some of the best electric skateboard available today, along with a list of their highlighted features to aid you in making your purchase. Hopefully, they can help you strike the proper balance between image and practicality, and either welcome you to the market or make you fall in love further. This creatively-named behemoth not only looks superb, but also boasts a powerful array of features which will turn the head of anyone looking to make a quality electric skateboard purchase. Its vivid coloring will only be matched by the metaphorical fire flying out of its rear as you pass by pedestrians and regular skaters. Superior range and speed. The problem with most electric skateboards is battery life. Because it takes a lot of space to store the power necessary to make these things run, usually the range on them leaves something to be desired. But the BLITZART Huracane dispels this cliché by boasting a 17 MPH max speed along with a range of 10 miles when fully charged. This is achieved with a 36V, 4.0Ah Lithium-Ion battery pack which can be fully charged within two and a half hours. Ergonomic, easy-to-use, wireless remote. Most electric skateboards are operated via remote. The issue is that not all of those remotes are comfortable to hold, and some of them are even connected to the board via wires. This board comes with an ergonomic remote which is as easy to hold as it is to operate. The controls for acceleration and deceleration are simple and there is even a reverse option. It also has a mode and speed for beginners and advanced users, as well as a wrist strap to prevent dropping. Maplewood and bamboo deck + grip tape. If build quality was ever your concern, well then the BLITZART Huracane has got you covered. It sports a 7-ply maple wood deck with two layers of bamboo for the bottom of the board. This makes it more flexible and more able to endure the speeds at which you will be riding it. The board supports a max weight of 250lbs and has grip tape on the deck to keep the rider’s feet firmly in place. 350W motor + regenerative brake. There are two types of motors available for electric skateboards: hub and belt drive motors. The Huracane uses hub motors for their superior reliability and smaller tendency to make problems. Hub motors also have the added benefit of contributing to an aesthetically-pleasing design. What is more, even if you run out of juice, you can still ride the Huracane like a regular skateboard. Fully-assembled shipping. We call know the hassle of getting a package full of parts that we have to put together in order to get our actual product. Well, with the Huracane all of that is taken care of, as the skateboard is shipped pre-assembled and ready to go straight out of the box. So there you have it. 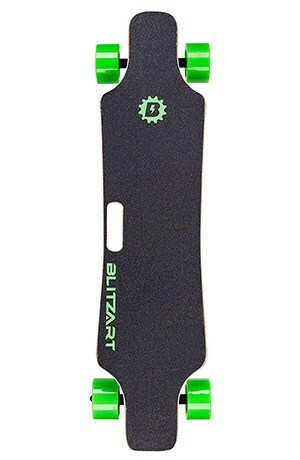 With its impressive list of features, the BLITZART Huracane is a great board for anyone looking to jump on the electric skateboard bandwagon, or simply improve their already existing collection. If a name like Phoenix Ryders is not enough to get your electric skateboard enthusiasm going, wait until you see the impressive array of features this thing packs. If the BLITZART Huracane was supposed to make you look cool, then this board will have you getting more attention than a rock star at their own concert. 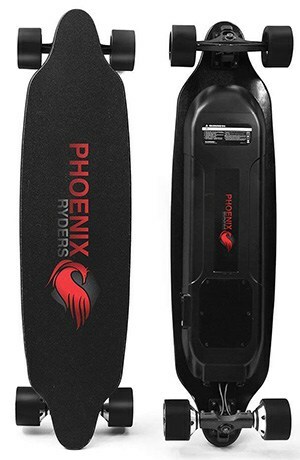 With its sleek, primarily dark design, the Phoenix Ryders Electric Skateboard combines speed with design and safety in a way few other boards can. High performance. If you thought the Huracane’s 10-mile range was impressive, wait until you experience this board’s 18.6 miles. Its speed is also adjustable between 14, 22, and 25 MPH, so y0u can ride this board comfortably at your own pace. It can also climb hills up to 25% steep and can support up to 275 lbs of weight due to its 8-layer northeast maple build. Powerful motors. This puppy sports dual 500 W Hub motors which have no problems going up hills and propelling you forward on any road you may find yourself on. They provide enviable speed and acceleration and make you the undisputed king of the road. On flat roads, be ready to turn some heads as people look at you like you are some speed demon. Design with safety in mind. Remember that talk about safety? You need not fear in the dark as the red LED taillight will provide you with all the company and guidance you need. Pedestrians and vehicles behind you will know that you are in front of them and make your own journey that much safer. We have mentioned this board’s deck before, but another feature of it is its impressive width. This makes the whole experience of riding it very stable and comfortable. Remote control. 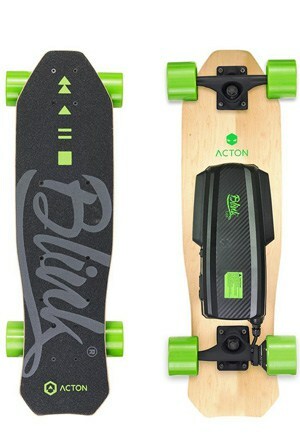 As with most electric skateboards, this board is controlled with a remote. But this is not just any electric skateboard remote—it is an easy-to-hold, easy-to-use tool with easy options for accelerating and decelerating, forward and reverse, or breaking. It is easily matched with the board and there are indicators of how much battery it has left, making it so you do not have to stop and check the board itself. Purchase with convenience. This electric skateboard comes with a 6-month warranty and a maintenance point in the USA for repairs. All of the boards have passed EMC, FCC, LVD, and ROHS quality authentications. With this purchase, you are not only getting a fast and reliable board, but are also guaranteed that your money will be well-spent. Those are the features. The Phoenix Ryders Electric Skateboard is a great option for anyone looking to up their e-board game. With a quality build, fast motors, and a considerate warranty, it is more than a satisfactory deal which brings with it a full package that is both safe and efficient. It is easy to boast that your board has superior speed, endurance, and safety when talking about riding it on flat terrain. However, once we get into the area of hill climbing and going over rough land, then few electric skateboards can hold a candle to the Atom All Terrain Longboard’s ability. If you have ever wanted to take your e-board off the city streets and up steeper hills, perhaps over dirt-y roads and such, then this board and its impressive list of features will soon become your best friend. Powerful motor. In order to deliver on all that it promises, the Atom All Terrain Longboard comes equipped with a 1000W motor, which allows it to easily traverse difficult landscapes. Where other boards would struggle, this board pulls through with ease. Superior software. This board’s remote is also offers some of the smoothest acceleration and deceleration experience of any electric skateboard. Braking is also made easier, which is important when going over all the little bumps and depressions on non-flat roads. Strong, reliable, and safe batteries. Atom uses the best Lithium cells available and makes sure all of them have used peak charge and discharge rates before being put in a board. Regenerative braking. Not only are atom’s brakes safe and reliable, they also charge your battery when braking. This will add even more range to your board and let you go that extra mile. Best value for money. Atom’s designers are electric skateboard riders, and therefore know where it is okay to save money on design and where it is not. This allows them to make a board which is safe and efficient but also affordable. Wider and coated wheels. Perhaps one of the most important features of this board are its wheels, as they are primarily what allow it to drive over rough terrain. Because of their width and texture, they easily go over bumps and obstacles which would definitely present problems for other boards. Granted, you cannot go over a field of grass or fine sand with this longboard, but these wheels make it handle other forms of rough terrain with ease. The wheels also possess friction to help with coming out of turns. Flexible bamboo deck. Another feature which makes riding the board in rough terrain more comfortable is the flexible bamboo deck. Its flexibility allows it to absorb whatever shock is left after the wheels have absorbed their share. All of this serves to maximize the rider’s comfort when going over the kind of surfaces that this board was designed to go over—rough, bumpy, and rugged. With all of these listed features, it is easy to see why the Atom All Terrain Longboard might just be the perfect board for off-road use. If you are an enthusiast for such adventures, definitely give this one a try. Although electric skateboards generally tend to be safer than regular ones, all of the boards we have listed so far, although being quite safe and secure, put a lot of their focus into performance and perhaps not as much in safety as some people would like. This is where the Bualo Electric Bluetooth Controller Longboard comes in. It is built specifically to offer the safest and most comfortable riding experience possible. Let us take a look at the features which make this board such a giant when it comes to safety and comfort. Safety light. This board has built-in LED lights which remain highly visible both during the day and night. This makes the riding experience that much more carefree, as you can focus on enjoying your ride rather than worrying if you are going to hit another person or vehicle. They also serve to make the board itself look quite flashy and will definitely grab the attention of many people. Bluetooth remote control. Few electric skateboards have as good of a remote connection as this one. With its remote, it is mind-numbingly simple to switch between forward, reverse, and break. There is even a Safety Lock feature which goes perfectly with the safety-oriented theme of this board. Two driving modes. This feature really accentuates the focus on safety that this device has. If you are an amateur who is not very experienced in riding electric skateboards, then you will appreciate the safe amateur’s mode which lets you drive at a lower speed until you get more proficient. On the other hand, once you get used to that or if you feel you are skilled enough, you can switch to expert mode and really propel yourself forward at high speed. Soft breaking system. Everyone wants their ride to be comfortable, not bumpy and jerky. That is why Bualo has put an upgraded breaking system into this board. With it, your ride will be as smooth as can be, with the breaks soft and gentle, allowing you to fully enjoy your riding experience. The breaks also make your ride safer. Risk free guarantee. The quality guarantee lasts six months within the United States. Unlike with many other boards, you need not wait for replacements from overseas. Bualo offers free accessory replacement and maintenance. If you have ever been concerned about safety while riding an electric skateboard, then the Bualo Electric Bluetooth Controller Longboard is probably the board for you. Its list of features offers the most safety of all the boards we have discussed so far, and ensures you a comfortable riding experience. Of all the electric skateboards we have looked at so far, the Teamgee Electric Skateboard is probably more towards the high end of the bunch. What makes it so premium is its superior build quality, built to last and endure quite a bit of abuse, and also the incredibly easy control mechanism of its remote. Let us now take a look at some specific features which all combine to make this e-board, as its name says, the vlogger’s best companion. Build quality. This thing is built to last. With an 11-play maple wood deck, it has been specifically designed to withstand all the shock and abuse that may come when riding through an urban environment. The bumps and irregularities of any road are no match for this flexible and sturdy piece of wood! With it, your daily rides will be much more pleasant and efficient, with no place you cannot arrive. Perfect control. Remember that advanced remote control that we have mentioned? It is not only easy to hold, but also allows for lightning fast switches from fast acceleration to instant braking. Of course, like most other boards we have mentioned, it comes with two speed modes but an extra feature found on few others is its reverse riding mode. All of these combine to provide a safe link between the board and the rider. Intelligent design. Have you ever wished that you could look like you are riding a regular longboard, when actually you are riding an electric one? Well, look no further, as the Teamgee Electric Skateboard has its battery disguised into the deck, which makes it look like a regular old skateboard. Furthermore, the pintail design of the deck makes it ideal for beginners, all of which allows for maximum carefreeness while riding around the urban landscape. Speed/range. The Teamgee Electric Skateboard can climb hills with up to 20% steepness, has a range of 10 miles, with a top speed of 18.5 MPH. It also features regenerative breaking. This serves to make the riding experience longer and more fun, while not imposing too many limitations such as having to have a perfectly flat surface to ride on. Open and ride. This board, like the BLITZART Huracane, comes pre-assembled in the package, saving you the trouble of having to put the thing together yourself. Just open the box, pick up the remote, and ride the board down your favorite street off into the sunset. This one is a bit different from all the rest, putting its focus on build quality and a premium appearance. Whether you are a beginner or experienced electric skater, you will be quite pleased with that this board has to offer. As its name implies, the SWAGTRON Swagboard is a board that puts its focus on making you look the best when riding down the streets. Although this board does boast a powerful array of features which will ensure that your riding experience is quick, safe, and efficient, it really excels in making you look like the best rider on the block. 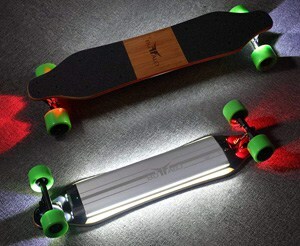 Outshine everyone else with ease by having this electric skateboard under your feet. We will now go over the list of features which this board has, and later touch back upon that design which is so eye-catching. Upgraded features. This board features some of the most advanced hardware. It has been upgraded to be top-notch and function smoothly and effectively. It has also been designed to be as durable as possible, so you know that buying it will be a worthwhile investment. Advanced battery management. The SWAGTRON Swagboard features an advanced battery management system which allows you to conserve energy and really pays off during those long trips. With this board, you have much less to worry about when it comes to battery life, although that does not mean it does not require regular charging. It simply means that the energy the battery does have will be managed much more efficiently. 24V Lithium ion battery (Fe). This board has some boost, enough to make its range equal 10 miles on a single charge. It may not be as fast as some other boards, with its top speed coming in at 11 MPH. This means that the board is more suited for beginners who still need some time to get used to riding e-boards around and are perhaps not yet ready to reach high speeds, or just for people who do not fancy being a speed demon. Be that as it may, this board will still get anyone where they need to go in reasonable speed. Wireless LED remote. Not only does this remote control speed, braking, and cruise control, but it also shows you what your current speed is and the battery status of the board. This comes in super handy as you have all of that information right there in your hand. This only supplements the great and responsive controls. Maple wood deck + premium grip tape. This board’s deck is a high-quality construction made of maple. It also features grip tape allowing for more friction for riders while riding the board, which makes the ride safer and more stable. This combined with its lower top speed further implies that the board is great for beginners. 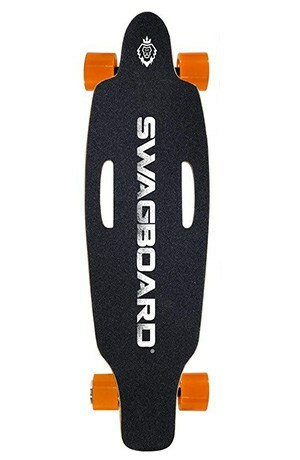 So with all that said, I think it is safe to conclude that the SWAGTRON Swagboard is a good-looking, high-quality board meant for less experienced riders or just people who prefer a slower ride. We have already seen the name PHOENIX RYDERS on this list. When we mentioned it the first time, we said how the board provides not only the highest construction quality and good speed, but also makes you look like one of the baldest speed demons on the street. This PHOENIX RYDERS Electric Skateboard is a bit different, in that it is a cheaper variant of the former without sacrificing too much on speed or build quality. Its features do not stray too far from what we have already seen in the boards so far, but they still deserve to be listed so that you know exactly what you are getting into by making this purchase. 83mm Brushless Hub 350W(each) Dual-motors. 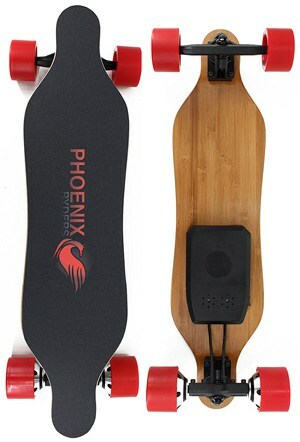 Just like the first PHOENIX RYDERS board we have mentioned on this list, this board sports dual motors, albeit less powerful—capable of a top speed of 12.4 MPH. They also allow the board to climb angles up to 15°. All in all, not overwhelming, but still enough for someone wanting to get a basic electric skateboard for an affordable price. Impressive battery. This thing sports a 4400mah capacity,29.4V lithium battery, which gives it a range of 12.4 miles. This is one of the areas in which this board truly excels at, as most other boards we have looked at so far have a range that caps at 10 miles. Quality build. The board is made of six layers of Canadian maple plus a layer of bamboo. This allows it to remain strong yet flexible, and carry a weight of up to 220 lbs. This makes it perfectly reasonable for the average rider and echoes the overall design philosophy of this board—not a lot, but enough. Wireless remote. Like most other electric skateboards, this board, of course, comes with a wireless remote control which allows you to control the acceleration, breaks, and it also allows you to change direction while riding, ensuring a safe and convenient ride. Quality wheels. A highlight of this board have to be its wheels. With a diameter of 51mm, 80A hardness and wear resistance, they will make your ride a smooth and bump-free experience. If you are looking for stability and a long-lasting set of wheels, then that is another reason why this board may be the definite choice for you. This is a bit of an odd one. It is a cheaper board and perhaps does not hold an impressive list of features like the rest, but it is more than enough for someone who just wants a simple, safe, efficient electric skateboard to ride around town. Koowheel has produced an electric skateboard which puts function over form, while still keeping the form factor solid and attractive. A lot of the components and features of this board center around ease of use and simplicity. Where other boards would have trouble, this board provides easy solutions for riders. Let us take a look at what exactly makes this board stand out from the rest, and in what ways it makes your riding life easier. Convenient battery switching. We all know how electric skateboard batteries work. Use one until it runs out, and then you have stop your ride or, God forbid, kick it like a regular skateboard, until you can charge the battery back up, which takes time. With the Koowheel electric skateboard, it only takes you about 15 seconds to replace the battery when it runs out. Just get a spare battery pack which weighs about 3.5lbs, and feel free to ride without fear of running out of juice. Stable motors. Like some other electric skateboards, this puppy features a brushless dual hub motor which keeps you stable and well-balanced even at high speeds. This ensures that your riding experience is smooth and guarantees a reduced amount of accidents while riding. Temperature control. If you have ever been concerned about the speed emanating from your board while you ride, then the temperature control on Koowheel’s board will really be a treat for you. It automatically reduces the speed of the motor slowly as it starts to overheat in order to protect the rider from getting burned or the board from being damaged. Strong build. The board is constructed of 7-ply Canadian maple wood, making it able to carry weight up to 285lbs. This makes the board both strong and flexible, which means you will have a stable feeling under your feet while also knowing that your board has enough give to it that it can absorb a lot of the shock that the occasional bump might produce. Great service. 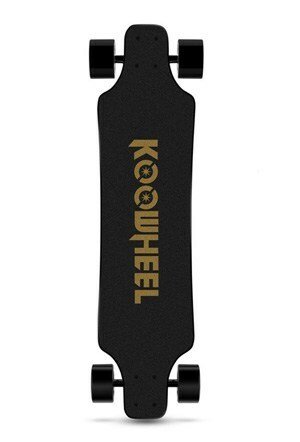 If you are by any chance dissatisfied with your purchase with this product, Koowheel offers a 100% money back guarantee. They also have an office in California which can provide you with all the service you need, so make your purchase without any fear of regret! Very simple battery switching, great customer service, high-quality board—what more could a rider want out of a board? Suffice to say, this one is a great choice. As we are nearing the end of our list, let us now take a look at a board whose greatest selling point is that it is the world’s lightest electric skateboard. This makes it perfect for youth. If you have an older child or teen who would like to have some fun on an electric board, then this board is the right choice for you. Furthermore, this board also happens to be the perfect companion for college students, which we will discuss further in the list of features. That being said, the board does possess other features which make it stand out, so here are the key ones. Perfect for younger riders. Unlike some other boards we have mentioned on this list, the main focus of this one is a fun and playful riding experience which will make your rides fun, whether you are going to school or simply riding around town. College students will also appreciate this product as it allows for easy movement around campus at a speed that is faster than jogging and yet not too fast. 6-month warranty. Acton guarantees that if something were to malfunction with your board, they will provide free maintenance and repairs for up to six months after the original purchase. Of course, the likelihood of anything going wrong is not great, but if something does happen, it is nice to know that the option is there. Safety lights. This board has built-in safety lights which make the rider very visible to pedestrians and traffic. They are visible both during the day and at night, ensuring a safe ride. There is no worrying necessary about whether or not someone will decide to get in the way of your board and sabotage both your ride and themselves. Lightweight and portable. This board weighs only 7.7lbs, which makes it incredibly easy to pack and carry around. This further adds to our claim that it is perfect for the busy college student, who needs easy and efficient transportation. Bluetooth remote control. This board’s remote control features buttons for turning it on and off or switching it between forward and reverse. All of these controls are quite simple and involve merely the pushing of buttons or levers. Everything about this board is designed for ease of use and practicality. It is lightweight, constructed with safety in mind, and is meant for youth. No matter whether you buy it for your child, teen, or college student, there is no doubt they will appreciate this awesome board. What a way to get the youngsters out of the house, eh? 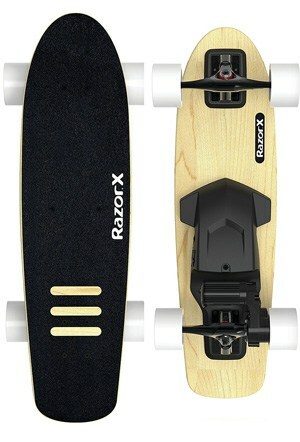 The final board which we will be looking at today is the appropriately named RazorX Cruiser Electric Skateboard. This board ranks among the cheapest in our list so far, and is another one of those great options for beginners or just riders who are not willing to cough out a fortune for a good electric board. Powerful motor and battery. This board sports a 125-watt motor powered by a lithium-ion battery. This allows it to go at speeds up t0 10 MPH for around 40 minutes of constant use—perfect for those rides which are on the shorter side, although you will not be able to spend an entire day with it. High quality deck. The RazorX Cruiser’s deck is not only long, but it is also constructed of 5-ply maple which makes it lightweight while also remaining flexible enough to absorb some shock from the road on which you will be riding this board (which probably is not going to be that rough in the first place). Good wheels. Another highlight of this board are its urethane wheels which feature high grip and reverse kingpin trucks. These increase the board’s stability and allow you to be more fearless while speeding down your neighborhood street on this safe board. It also features a rear-wheel drive. This board will support a rider with up to 220 lbs, and is recommended for ages 9 and up. As with most electric skateboards, perhaps it is not the best idea to give this board to a small child. Your teens and older children however will be thrilled (and safe) to give this puppy a try. No matter who you decide to give it to or even if you choose to use it yourself, the RazorX Cruiser is a comfortable board for the price, and should meet a lot, if not all of your needs. And there you have it, ladies and gentleman. We have looked at ten of the more stand-out electric skateboards currently available on the market. We have delved into what makes each board unique, and given you a wide array of features, some of which span across most of the boards, and some which are exclusive to one or two. Whatever the case may be, each of these boards is good and useful in their own way, and the key is to decide what your priority is when purchasing such a product. Hopefully after reading through this article, you will have a better idea of what an electric skateboard is, whether it is the right thing for you, and if it is, which one in particular is best suited to your electric skating needs.